The new construction builds off of the success of a two-year pilot. The pilot program brought fiber to seven downtown buildings. The program showed that public and private organization could work well together. All while helping to build a better Eugene. Due to competition from many service providers, and government investments. The buildings now have access to faster speed internet at lower prices. The next logical step is to expand. So the new fiber increase will cover a large part of downtown Eugene. Construction will begin in the spring and should take a year and a half to finish. Four groups all had a part to play. The City of Eugene, and Eugene Water & Electric Board. Along with Lane Council of Governments, and the Technology Association of Oregon (TAO). Like our own local Avengers team. 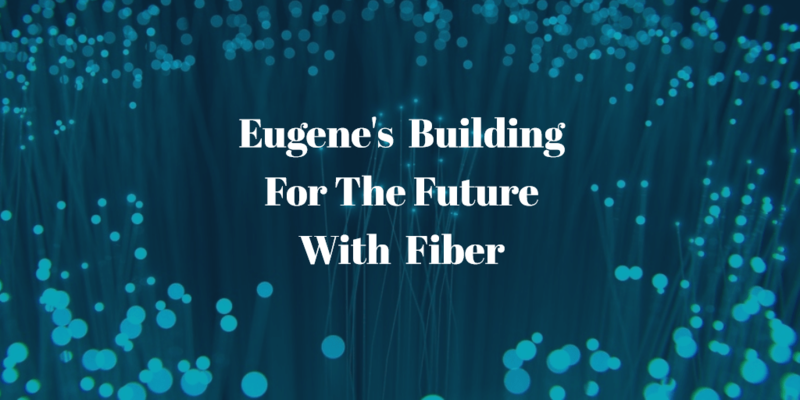 These organizations came together to bring high speed broadband fiber to Eugeneans. I’m still trying to decide who’s playing Iron Man and Captain America. The city created a broadband strategic plan that outlines the work needed. A lot of individuals came together to help plan everything out. You can see this from the long list of names on pages two, and three of the document. The strategic plan is a little stuffy but here’s what you need to know. Eugene’s community broadband plan has five main goals. The city wants to get everyone on board with wanting higher rated broadband. They want to make broadband more affordable so having a great connection in the new norm. Inspiring teachers and students to do more with better access to broadband is also a key focus. Another goal is to continue build Eugene into a world class innovation center. Finally speed up the growth of the local tech scene downtown. It seems like the delivery method for most of this is the formation of EUGNet. EUGNet is the largest open access fiber optic network in Oregon, spanning about 1,200 miles. In Spring almost 120 buildings in downtown Eugene will connect. This internet backbone bringing world-class internet to our city. And also connects Portland to the Silicon Valley. A few internet providers are already lined up to build off of EUGNet. This list will grow over time. What the hell is fiber? No it’s not the stuff that makes you poop. Well it is but that’s not what we’re talking about here. Fiber provides super fast internet connection speeds. The name comes from glass cables that use beams of light to transfer data. The fastest data transfer records are currently broken by new fiber optic technology. The average Oregonian download speed is about 37 megabit per second (Mbps) for uploads. The average download speed is near 11.7. The download speed is most important. Unless you’re uploading a lot of videos to YouTube or post a lot of selfies on Instagram. Either way fiber is way better in both cases. With a fiber network most providers will offer download speeds of one gigabit per second (Gbps). That’s equal to about a thousand megabit per second. That means you can download a two-hour HD movie in twenty five seconds instead of four and a half minutes. That’s a big jump in speed. So do normal people need gigabit connection probably not… today. In the next few years you’re going to need better broadband to access the highest tiers of most services. If not you’re going to have painful loading times. One day websites will start to assume people have better download speeds. With Fiber we solve a current problem for business and a future problem for normal folks. I think the real fear about this type of thing is gentrification. It’s the same reason why I get a little nervous about telling people I’m from California. Some people think newcomers flood the state with outside money and ruin Eugene. They’re partially right. But the growth can helpful for everyone in Oregon. I’m still looking to pay my fare share to be here. Yes there are runaway effects that could ruin things but it’s a great problem to have. It’s definitely better than the opposite effect. Ask Detroit. If you’re using the internet for email only one Gbps downloads won’t help out much. But the growth benefits promoted by a fiber network will outweigh most downsides. Consumer bandwidth consumption seems to double every two years. Eugene business currently need higher broadband speeds to continue having a great experience. Resident of Eugene will follow shortly. The focus on downtown is a bet on Eugene being a city that can build a thriving tech sector. The main benefit of the fiber network seems to be the growth it will prompt. This is an investment in the future by the city for the city.